Two outs from a 3-1 victory on Tuesday night that would have earned a series win in Kinston, Marcos Frias gave up consecutive solo home runs that tied the ballgame and sent it to extra innings. In the 12th, a critical P-Nats error extended the inning and set the stage for Anthony Gallas’s single into left field that lifted the K-Tribe to a 4-3 win. The Nationals, plagued by errors in the series, had played a sparkling defensive game until the 12th. But Justino Cuevas saw a tough chopper clip off his glove at third and into left field; two batters later with two outs, Gallas drilled a 1-2 pitch to deep left center field that won the game for the Indians and pushed their second half record to 5-1. Potomac falls to 2-4 with the defeat. 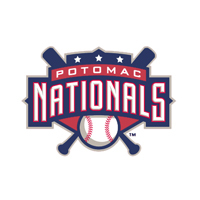 The late inning troubles spoiled a fantastic start by Adam Olbrychowski, the best offensive night of J.P. Ramirez’s season, and otherwise sterling defense by the P-Nats. Olbrychowski outdueled Kinston knuckleballer Steve Wright and allowed just one earned run in six and two thirds innings. The Indians got just four hits against Olbrychowski, who struck out four and had an overwhelming curveball. The Nationals spotted the righthander a lead with single runs in the first two innings. Each time, a lead off single (by Francisco Soriano in the first and Ramirez in the second) became a run on RBI groundouts. Justin Bloxom plated the first run and Eury Perex made it 2-0 with a chopper to third in the second. The Indians cut the lead in half with consecutive two-out doubles in the fourth by Jeremie Tice and Adam Abraham. Ramirez pushed the lead back to a pair with his sixth home run of the season, a deep blast to right field in the sixth that made it 3-1. Josh Smoker relieved Olbrychowski, who walked the last two batters he faced, with two outs in the seventh. He struck out Delvi Cid and retired the Indians in the eighth to give way to Frias. After Frias struck out Abraham to open the inning, he gave up a homer to Chase Burnette that drew the Indians within one. It was Burnette’s first home run since May 7. The next batter, Tyler Cannon, tied the game with a blast to deep left. Potomac mounted virtually no threats in extra innings: their only hit was a one-out single by Sandy Leon that was erased on the next pitch by a double play. The Nationals head home having dropped four of six in the second half’s first road trip. The Winston-Salem Dash come to Woodbridge for a three-game set that begins Wednesday night at 7:05 P.M.